Remember the referendum in April in which voters in the Netherlands rejected the EU-Ukraine trade deal? Seems forever ago, doesn’t it? But to date nothing has been done with the outcome of the vote, even though Dutch law requires a government to implement referendum outcomes as swiftly as possible. PM Mark Rutte told parliament this week that ‘changing’ the deal would be very difficult, and that talks on the topic in the European Council ‘don’t make him happy’. Since one of the things Rutte has demanded from the EU is a pledge that Ukraine will not become an EU member, none of this should be surprising. But more importantly, the Dutch didn’t vote for Rutte to renegotiate the deal, they outright rejected it. Ergo, Rutte is playing fast and loose with the integrity and credibility of the Dutch legal and political systems as much as the FBI does with America’s in the Clinton email sleight of hand, and as later today Britain will do with its credibility following the Chilcot report on Tony Blair et al. As if the Brexit fall-out hasn’t done enough damage to that credibility. One might get the distinct impression that the powers-that-be could get awfully annoyed with the riff-raff out there wanting a say in their own lives. But the riff-raff don’t just want a say anymore, they are getting mighty annoyed with the powers-that-be too. And that is guaranteed to increase if more ‘incidents’ happen like FBI director Jim Comey’s announcement yesterday that Hillary won’t be charged. At some point credibility must come with accountability, or else. The Hillary files bring the US awfully close to that point, as well as to ‘or else’. There can be no excuse for Obama’s depriving the public, via a grand jury decision, of the right to determine whether a full court case should be pursued in order to determine in a jury trial whether Hillary Clinton’s email system constituted a crime (or several crimes) under U.S. laws. The Obama Administration’s ‘finding’ that “clearly intentional and willful mishandling of classified information” would need to have been proven, in order for her to have been prosecuted under any U.S. criminal law, is a flagrant lie..
[..] anyone who in the future would be charged with violating any one of those six laws could reasonably cite the precedent that Ms. Clinton was not even charged, much less prosecuted, for actions which clearly fit the description provided in each one of those U.S. criminal laws. Anyone in the future who would be charged under any one of these six laws could prove discriminatory enforcement against himself or herself. It is highly irresponsible for any government to play such games, and it’s skating on the edge of the law, something a government should always attempt to avoid. That is essential. Someone who’s not known to be overly bothered by accountability or integrity is everybody’s favorite wino, European Commission President Jean-Claude Juncker. But Juncker, whatever else may be wrong with him, is not a stupid man. And unless I’m gravely mistaken, he has just saddled the European Union with a problem that could well trigger its undoing. What happened was that at some point last week, reports started coming out that several parties, especially in Germany, were planning to oust Juncker from his plush job. He read them too, of course. And he may have gotten other signals as well in Brussels backrooms. Then, Germany and France began to clamor for their parliaments to have a say in the ratification of CETA, the Comprehensive Economic and Trade Agreement between the EU and Canada. And Juncker must have seen his chance for revenge. Because yesterday he announced that all 27 parliaments of EU member nations get to have a crack at CETA. European Commission chief Jean-Claude Juncker is expected to scrap plans to fast-track a trade agreement with Canada through the EU. After pressure from Germany and France, Juncker appears to be backtracking. Juncker will reportedly propose a mixed agreement – one that requires both the approval of the European parliament and national legislatures – at an European Commission meeting on Tuesday. Last week he was reported saying he “personally couldn’t care less” whether lawmakers get to vote on the deal. A report in the Financial Times noted that Germany and France wanted their national parliaments to be involved, which would inevitably lengthen the process. The deal was scheduled to be signed at the end of October during a summit in Brussels with Canadian Prime Minister Justin Trudeau, and it was due to be implemented in 2017. Trade ministers in Germany, France, Italy, the Netherlands and UK have reportedly said they will support the Comprehensive Economic and Trade Agreement, or CETA. CETA is similar to the agreement under negotiation between the EU and US and has drawn strong criticism in EU countries. Canadian and EU leaders concluded CETA in 2014, but implementation was delayed due to last-minute objections in Europe. This was related to an investment protection system to shield companies from government intervention. Yes, CETA is TTiP on a smaller scale. A sort of test. The nonsensical audacity of ‘an investment protection system to shield companies from government intervention’ says it all. With opposition to the EU’s impending free trade deal with Canada apparently growing, German Chancellor Angela Merkel said recently that the German parliament should be consulted on the EU’s free trade deal with Canada. “It is a highly political agreement that has been widely discussed,” said Merkel, adding that the “Bundestag is allowed to be involved of course… in national decisions”. German Economy Minister Sigmar Gabriel told the Tagesspiegel daily that Juncker’s comment was “incredibly stupid” and “would stoke opposition to other free trade deals,” including with the US. German media has also described Juncker’s position as badly timed given the growing skepticism among European voters about the EU. What Gabriel actually said was that Juncker was “unglaublich töricht”, I looked it up. And it wasn’t his reaction to a ‘comment’, but to Juncker’s initial decision to NOT let national parliaments get their say on CETA. It’s brilliant and hilarious, isn’t it? I think I think quite a bit higher of Juncker now. Because it was Germany itself that insisted they wanted the Bundestag to get involved (under domestic pressure). But they thought that would be it, that and the French parliament. And Jean-Claude threw it right back in their faces. Since they were going to get rid of him anyway, he decided to leave them the perfect parting gift, the ultimate poisoned chalice. Getting back to the Dutch referendum on EU and Ukraine, one of the things to know about how this works is that the Dutch can ask for a referendum not on any topic, but only on bills the government sends to parliament to discuss. CETA will now be such a case, and a referendum looks at least quite possible. I don’t know what comparable legislation is in other EU countries, but no doubt in many countries it’s enough to have their parliaments discuss the issue, to cause havoc. That will mean huge delays and/or worse (just what Juncker initially sought to prevent). The ‘worse’ in this regard -in the eyes of the politicians- is the possibility of referendums, on CETA, and then on TTiP. And before you know it somewhere in Europe such a referendum will be combined with the question whether the country where it’s held should Remain in the EU or Leave it. It seems for all intents and purposes, inevitable. How the EU can be kept together is a behemoth conundrum already, even without all these new issues. But now we can be absolutely sure that Brexit is only the beginning. Beppe Grillo’s Five Star Movement (M5S) came out as no. 1 in a poll in Italy yesterday. When I visited Beppe almost 5 years ago in Genoa he was still torn over the EU and the euro, but he has since made up his mind: he’s determined to take Italy out of the unholy Union. Europe’s powers-that-be are in for troubled times. And Jean-Claude Junker will be sitting somewhere in the world in a beach chair by one of his luxurious summer homes, with a big smile on his face and a stiff drink in his hand. This topic contains 12 replies, has 8 voices, and was last updated by TheTrivium4TW 2 years, 9 months ago. I should hope that the world’s economic model is coming undone. It is directly responsible for the greatest impoverishment in history of 1st world countrie’s citizens; and the utter exploitation of third world countries; especially if they hold valuable natural resources; predominately oil, gas, and rare earth minerals; coal, not so much. The corruption is arguably the worst in history because the shear numbers and the fact it affects the entire planet. By the way, the edit feature doesn’t work anymore. An authoritative statement that “we should do something”. No suggestion of any kind as to what, however. First step? No clue. Evolution is going to happen, regardless. Shrinking identity groups, sharks starting to attack each other. Not the kind of chaos THEY like but it is going to be great entertainment. V. Arnold, whaddaya mean? Anyone else notice that, the Edit function not working? My edit will reliably work the 1st time but not thereafter on Firefox. Edit is working (1st time) right now. No idea what causes that. Get it right first -or even second- time around?! Very consistently for over a week, when I try to use the edit function “it” asks me to ptove I’m not a robot and wants e-mail and explaination and then fails to post my edit. This just started in the last week; no F**kin idea. When things start to unravel, they tend to do so in parallel. Here is a small article in French. Apparently, when there was that big shootup in the Bataclan Disco in Paris – in which a huge number of people were allegedly killed – the army and gendarmerie were watching and did not intervene. This went out on Belgian TV in an interview with someone close to the French minister of defence. 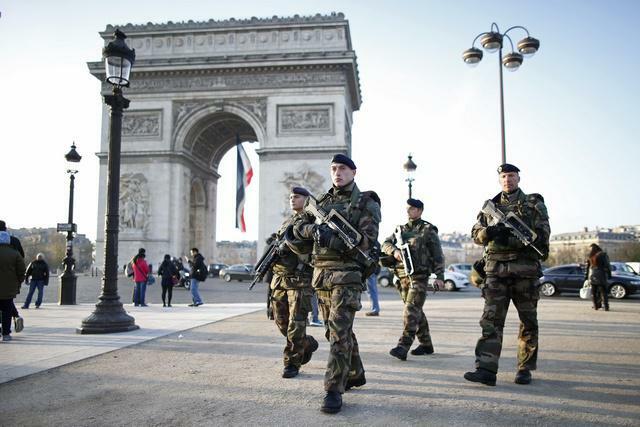 There were 6 armed French soldiers across the street from the incident. V. Arnold, Diablo et al, this has something to do with the fact that we moved to https (secure), but I don’t know what exactly. We’ll look into it. Another thing I’ve noticed is that Statcounter has become erratic, mostly counting only a fraction of actual visits and page views. We haven’t done jack diddly squat until the Debt-Money Monopolists are on trial for treason and the Money Power has been returned to an educated population. Therein lies the rub… that education only occurs in the comments section of the blogs… and ordinary people are dog trained to not use their own minds to evaluate the validity of what other ordinary people say – even if proven beyond any and all doubt to the doubt Steve Keen runs away protecting his Sith Lords in the Banking Clan.